Speed Bouncing Up and down but generally slow. 50+/20+Mbit VDSL internet connection on Gbit Ethernet wired network. Speedtest maxes out the theoretical line maximum. Sonarr/Radarr on same host (preferring Usenet). My system was offline for a few months during a house move. Updated all software, signed up to some new new-servers and restarted, so I now have a backlog of 500 posts. Getting 2/3 of them failing due to "Download failed - Not on your server(s)" or "RAR files failed to verify". Speed during download is varying between almost full speed of the connection at approx 5100KB/s but it will spend long periods at 900KB/s or 230KB/s especially if its on a post with missing articles. News servers have been set to 7 connections each. 3x usegroupdirect servers and 1x usenetbucket server at pri 0, 1x usenet farm at pri 5 and 1x blocknews net at pri 10 (block account). Re: Speed Bouncing Up and down but generally slow. 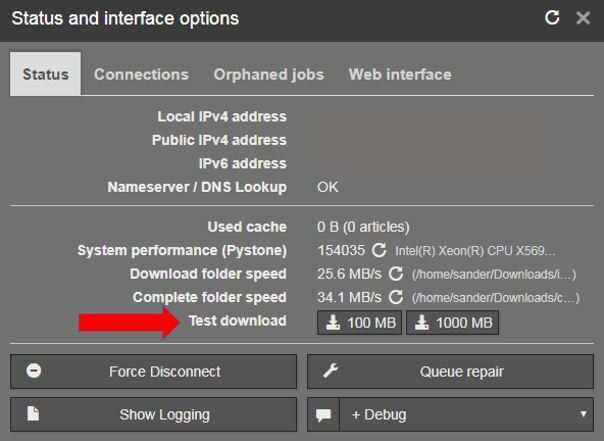 Then only add 1 server, go into Status and Interface settings (the wrench icon) and click the 1000MB test-download. Your system should easily get max speed on your connection, since my old i5 can maintain 1GBit speeds. In 2.3.7 the "Check before download" feature should no longer be needed, since we will fail jobs super quickly now using new techniques that barely use any data. The slow speed on missing articles makes sense, since it is really slow to ask the server if the article is there and then move on when it isn't. It has to do this for all your servers. Click on the Wrench symbol ("Status and Interface Options") in the upper right corner. Then, in the default tab Status, click on Test Download options: 100 MB, or 1000 MB. What speed do you get with those downloads? test file came at at between 2-3.1MB/s. Disable all newsservers but one, set connection to 15, do the Test Download again. So ... test which newsserver is fastest (and slowest). Reason: in my experience, one slow newsserver at the hightest prio can slow down the overall download speed. How can I post a screenshot ans a newbie? Could be that your ISP is limiting you. Wouldn't make sense otherwise.. These speeds are just to slow. And this is with the basic settings? Not tweaked too much? Could always try a trial at a different server, maybe Frugal Usenet? Right now I’m more concerned about the low end speeds and failed post handling. I have from time to time max Ed out my connection, but at the moment it’s taking 12 hours to download/fail 10-15 posts. Testing all 4 servers is slow. If you prefer to be faster, use only 1 server-setup per server. So a total of 2. I have tested each server individually with 15 connections. (Previously all set to 7). It is a pretty standard setup that’s worked normally in the past. Posts hanging at 90-99% filling the download drive. If I then Search for them and sending them to the top of the queue it gets them completed and nicely tidied up. It's definitely an issue with incomplete posts. It only occurs when there are one or more "yellow progress bar" posts downloading I'm looking at 2 now that are at over 80% over 1000 missing articles and still trying to download. It's definitely an issue with incomplete posts. Uh? Yes ... incomplete posts will give slow download speeds. It only occurs when there are one or more "yellow progress bar" posts downloading I'm looking at 2 now that are at over 80% over 1000 missing articles and still trying to download.